This oil, as evaluated numerically by the mean of a certified taste panel, contains zero (0) defects and greater than zero positive attributes. In other words, more than half of the [trained and IOC-recognized] tasters indicated that it is not defective and has some fruitiness. Extra-virgin oil also must have a free acidity percentage of less than 0.8 and conform to all the standards listed in its category. This is the highest quality rating for an olive oil. Extra virgin olive oil should have clear flavor characteristics that reflect the fruit from which it was made. In relation to the complex matrix of variety, fruit maturity, growing region, and extraction technique, extra virgin olive oils can be very different from one another. According to reports, consumers spend $700 million per year, paying premium prices, on extra virgin olive oils based on the representation that extra virgin olive oil is of a better quality and taste than inferior virgin olive oils or olive oils. But the UC Davis study found that 69% of foreign extra virgin olive oils and 10% of California-produced extra virgin olive oils failed to meet the IOC’s standards for “extra virgin” classification. As such, the complaint alleges that California consumers have been defrauded by the misrepresentations of the defendant companies. 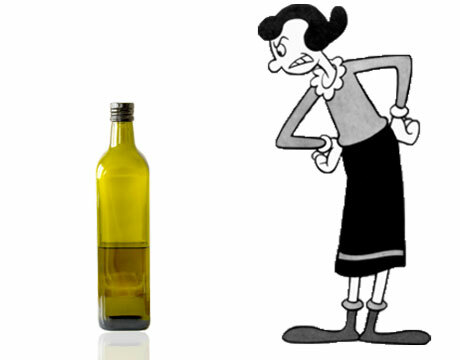 Popeye's girlfriend Olive Oyl, right, just learned that her favorite olive oil isn't truly extra virgin. Defendant olive oil brands include Bertolli, Filippo Berio, Carapelli, Colavita, Mezzetta, and Pompeian. However, also among the brands named in the complaint are Rachel Ray and Safeway SELECT. Rachel Ray is a Food Network television celebrity chef whose star power generated a line of cooking-related consumer products. Safeway is an American grocery chain that, in addition to selling global grocery brands’ products, has developed its own in-house brands, which include the premium product brand Safeway SELECT. Given that Rachel Ray is a television personality and Safeway is a grocery store, the products sold under these brand names are most likely not produced in-house directly by their namesakes. They are presumably manufactured on behalf of the brands by third parties that operate under license agreements, manufacturing agreements or some such other contractual arrangement. I’m not privy to the arrangements through which Rachel Ray’s EVOO [Note: EVOO is Ms. Ray’s famous on-camera identifier for extra virgin olive oil] or Safeway SELECT’s extra virgin olive oil bottles are produced. But I think the UC Davis report and the subsequent class action complaint are good reminders of the importance of including quality control measures and indemnification obligations in such agreements. Licensing is often a beneficial method for a brand to expand its product offerings; consumers who trust the brand’s core offerings seek out new ways of experiencing the brand through new products, whether manufactured in-house or through licensing arrangements. Even if this complaint is ultimately dismissed, all defendant brands may experience some damage to their consumer good-will, but for the licensed brands, this damage was essentially out of their hands. Whether they may have recourse against their manufacturers and/or licensees will depend in significant part on the strength of their contractual agreements.